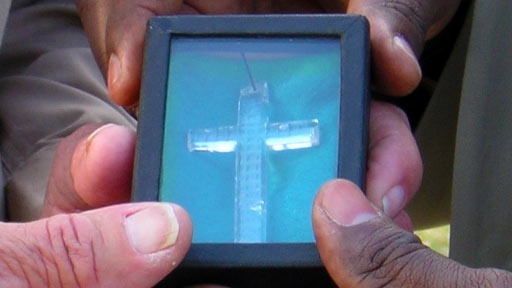 The current chief of the Apalachee Tribe has a crystal cross that was discovered at an archeological dig of an old Spanish mission. He wants to know if it could possibly have been made centuries ago by his own ancestors. About 15 years ago, archeologists at the Mission San Luis in Tallahassee, Florida made an astonishing discovery. In the process of excavating several hundred bodies at the site of this 17th century Spanish mission, they unearthed a beautiful and undamaged glass-like cross. The current Chief of the Apalachee Tribe says his ancestors once lived near the mission, but fled when British forces raided in the early 1700s. History Detectives journeys to Florida to examine the Spanish efforts to proselytize among native tribes and explore the fusing of native and Christian ideologies and symbols into a unique version of New World Catholicism. Related Investigation Universal Friends What can this 200-year-old document reveal about the first American-born woman to lead a religious movement? Also in Season 4 Silent Film Reel Could this film reel could be a silent movie once lost forever to history? Also with Tukufu Zuberi Vicksburg Map Could this mysterious map have been at the front lines of one of the most explosive battles of the Civil War? Also with Tukufu Zuberi Independence Trumpet Is a Pennsylvania man's trumpet somehow tied to the Revolutionary War? Also with Tukufu Zuberi Lee Family Doll Did this doll belong to a former slave of General Robert E. Lee? Also in Season 4 Rebel Whiskey Flask Is this flask a relic from the historic "Whiskey Rebellion" of 1794?